Targeting (対（たい）象（しょう） taishō, verb: 対（たい）象（しょう）とする taishō to suru) is a means of designating which specific cards are affected or used by card effects. Cards that target make players choose at the time of activation the specific card(s) that it will affect. When using a card that targets, you must declare the target(s) before players are allowed to chain to the effect. The target's locations is always specified. It can be the field, Graveyard, or the Banished Zone. There are no cards that would target a card(s) in the hand, Main Deck, or Extra Deck. There are also cards that generally use the term "card(s)", and cards that specify if the card in question is a Monster, Spell or Trap, as well as cards that specify more what the Type of the Monster, Spell or Trap card is. If the card's text says "target", then the effect almost always targets. If the card's text says "select", or "designate" then the effect usually targets, although there are some exceptions. When in doubt, check the card's rulings to see whether or not it targets. The introduction of Problem-Solving Card Text made all card effects that target, except Equip Spell Cards, specifically use the word "target" in their card text. Example: Player A activates "Raigeki Break" and targets Player B's "Number 39: Utopia". 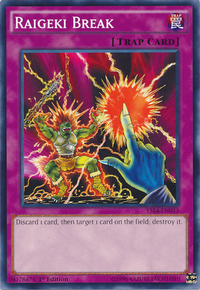 No card is chained, thus Utopia is destroyed and its Xyz Materials (if any) are sent to the Graveyard, and then "Rageki Break" is sent to the Graveyard. While targeting usually allows the player to make choices, some cards that do target do so without the player's input. Such cards include "Magic Cylinder", "Sakuretsu Armor", and "Dimensional Prison". Example: Player A controls "Darkness Neosphere" and "Dark Highlander", and attacks Player B directly with "Darkness Neosphere". Player B activates "Magic Cylinder". At this time, "Magic Cylinder" automatically targets "Darkness Neosphere" and the Player B doesn't have to say what card he/she targets. Most Counter Trap Cards do not target for the same reason - most only respond to the card/effect that was activated before it, meaning there is no selection, thus no targeting. If a card is targeted by a card another effect is chained to the original effect so that the target is not a legal target when resolving the original effect, then you do not get to "re-select" the target. The original effect resolves without effect (that is, it does nothing). Example: Player A activates "Offerings to the Doomed" and targets "Dark Magician". Player B chains "Book of Moon", targeting the same "Dark Magician". "Book of Moon" resolves first, and changes "Dark Magician" to face-down Defense Position. Then, when "Offerings to the Doomed" resolves, "Dark Magician" is not destroyed - "Offerings to the Doomed" can only target face-up monsters, and "Dark Magician" is face-down, so "Offerings to the Doomed" resolves without effect. You do not get to select a new monster to destroy. Cards like "Dark Hole", "Mirror Force", "Lightning Vortex" and "Raigeki" do not target, because the player does not specify which cards will be affected - rather, it destroys all monsters, regardless of whether or not the monsters were on the field at activation. Likewise, "Fissure" and "Magical Dimension" do not target, because they select the monster to be destroyed when you are resolving the effect (and not when it is activated). In short, cards that don't say "target" in their card texts do not target. This page was last edited on 30 December 2017, at 10:33.